The Shapes of Trees continues today with an Asian import. Some Pittsburghers call this tree a sumac but it’s a case of mistaken identity. Sumacs are in the genus Rhus. This tree is an Ailanthus, specifically Ailanthus altissima. Its common names include Tree-of-Heaven as it is called in China, and “Tree From Hell” because it’s so invasive in North America. Ailanthus has a unique shape in winter with sparse, thick, crooked branches in an open crown. They’re always reaching up. The branches look crooked from a distance because the twigs are stout and blunt and the buds are large and alternate. Each bud changes the angle of the twig. 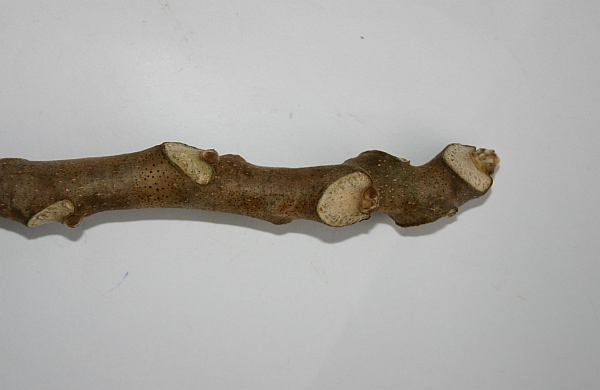 A twig can be as fat as your finger. Trees have been known to sprout from roots 150 feet away from the original trunk and grow over 12 feet in a year. Read more in this vintage post, Winter Trees: Ailanthus. Last year I recall a biological that would kill Tree of Heaven. Info please. Nan, I didn’t hear of it. Do you have more information? Art Gover, thanks for the reference. I have one of the chemicals which I use on my gravel driveway. I thought that chemical was not to be used around eatibles. A couple years ago I hired a horticure graduate. Unfortunately I paid ahead of time and he sprayed when I wasn’t home. The expert killed by herbs, killed my raspberries, and left me with 2 ft. stumps which returned. The expert now sells realestate. The treatment method I described would not threaten non-target plants, edible or otherwise. You hold the spray bottle inches away from the cuts on the stems. The chance of getting the material where you don’t want it is remote. There’s a beautiful conical-shaped tree in Cheswick not far off Pittsburgh St near where the theatre used to be. I’ll have to get a photo sometime. Not sure what it is, but the trunk has deep grooves in the bark. Back to Tree of Heaven. Impossible to get rid of, leave a bit of root and “I’m back.” The biologic was probably mentioned in Valley News Dispatch (Trib). Fungi ? Specific? Applied by professional at root. Where oh where is the professional and what does he charge? There is a naturally occurring fungus, Verticillium nonalfalfae, or now often referred to as Ailanthus wilt. Biologically speaking, you can use infected trees as an inoculum source to infect non-infected trees. It is not a commercialized product as it has not been registered as a biopesticide by the EPA. Therefore, a professional service would not be permitted to do that for you. It was first isolated by researchers at Penn State. It is also being researched at WVU by a former Penn Stater and his students, with the hope of eventual registration and commercialization. In the interim, the easiest way to kill Ailanthus is to use the “hack and squirt” method from July through September, where you make spaced cuts around the trunk and apply a concentrated herbicide such as triclopyr or glyphosate with a spray bottle to the fresh cuts. You can cut down the treated stems in the winter. Treating stumps is not effective, whether using a DIY remedy or registered herbicide, as the material will not move into and kill the roots. A Tree Grows in Brooklyn” was an Ailanthus. Mature Ailanthus trees are as beautiful as any so called native tree. The Ailanthus was planted as a “street tree” in the 19th century, surviving harsh city conditions and thrived- unlike so many of our younger street trees today. I take many long walks around the East End and I have seen most street trees survive on an average of about 2-7 years, in which they grow sickly until dead. I’m often puzzled that humans despise anything that is “common” because it thrives. The Ailanthus does not threaten other native trees, they are all getting along just fine. 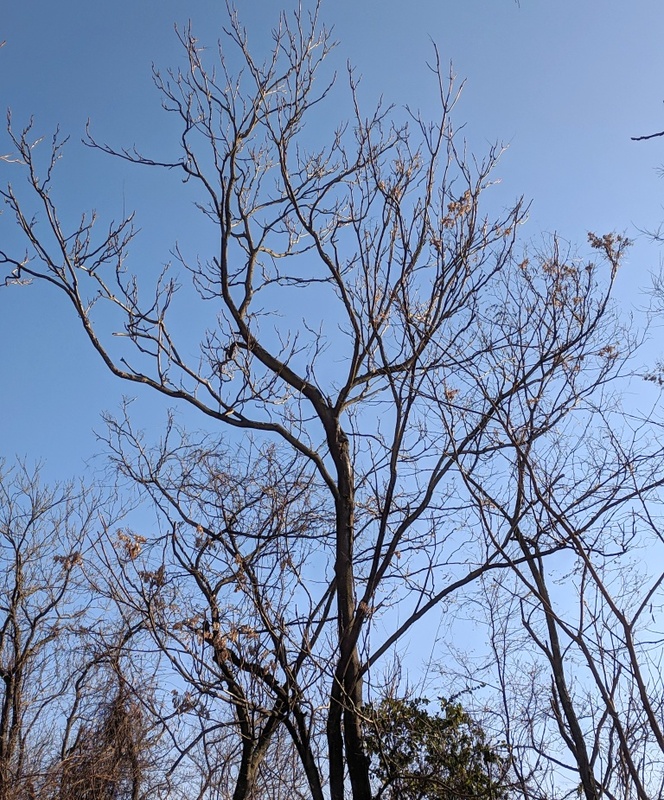 They are considered a problem when foresters clear land of all trees, and the Ailanthus is the first to return to, and survive the bare land where they cut all the native trees down.